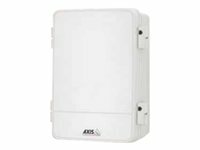 The polycarbonate, AXIS T98A-VE Surveillance Cabinet Series is IP66-rated for protection against the ingress of dust and high pressure water jets from any direction. The NEMA 4X rating protects against windblown dust, salt spray, rain, hose-directed water, and damage from external ice formation. It provides also IK10-rated material for protection against impact and vandalism. The surveillance cabinets support vibration rating 4M4 and 4M3 (AXIS T98A18-VE). The modularity of AXIS T98A-VE Surveillance Cabinet Series enables different categories of installers to do their part time separated in order to optimize the workflow. Firstly, the installer mounts AXIS T98A-VE Mounting Plate with cable protection Secondly, the certified electrician mounts the mains power parts and cover them with the power cover Thirdly, the installer can finalize the installation of the low-voltage units AXIS T98A-VE offers several ease of installation features to simplify the work for the installers. 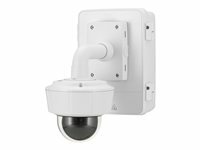 With a selection of optional mounting brackets, AXIS T98A-VE Mounting Plate can be installed on a wall, pole or building corner. The polycarbonate cabinet base is extremely lightweight that can be easily carried in one hand. The cabinet door can be left or right hinged, thanks to removable hinge pins. Furthermore, the hinges have a stop that locks the cabinet door at 105° to avoid that the door hits back the installer. A DIN rail is pre-mounted for those units that can be snapped on it by using a DIN rail clip. A molded DIN rail is also designed on the inner right-side of the cabinet base. The cabinet base can hang on the hooks of the mounted plate while cables are routed and connected. In a secondary step the cabinet base is slid and secured on the mounting plate with screws. 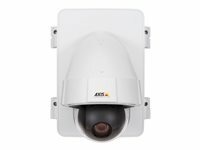 Versatile, outdoor-ready cabinets for easy and sleek installation AXIS T98A-VE series combines and protects mains-powered and low-voltage components in an easy-to-install, sleek design that blends together with outdoor-ready PTZ, fixed and fixed dome IP cameras. Ease-of-installation AXIS T98A-VE offers several ease of installation features to simplify the work for the installers. 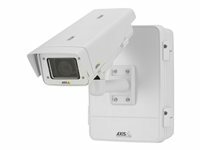 With a selection of optional mounting brackets, AXIS T98A-VE can be installed on a wall, pole or building corner. The polycarbonate cabinet base is extremely lightweight and can easily be carried in one hand. For maximum installation flexibility the cabinet door can be left or right hinged. To facilitate cable routing the cabinet is fitted with a specially designed mounting plate allowing the cabinet base to temporarily be mounted in a higher position and the hinges have a stop that locks the cabinet door at 105-degree. The cabinet is also designed with pre-mounted DIN rails to make it easy to connect components. Vandal-resistant to withstand adversities The polycarbonate cabinet is IP66-rated for protection against the ingress of dust and high pressure water jets from any direction. The NEMA 4X rating protects against windblown dust, salt spray, rain, hose-directed water, and damage from external ice formation. It provides also IK10-rated material for protection against impact and vandalism. 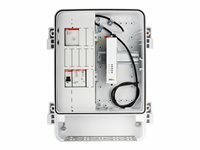 Separated compartments to enhance security For better installation and improve cost efficiency, the inner compartment with a DIN rail can be split into two sections: one to fit mains power units and a second for low-voltage units that do not require installation by a certified electrician. An optional electrical safety kit is available, which includes surge protection, a fuse and an alarm-door switch to detect cabinet intrusion or damage. 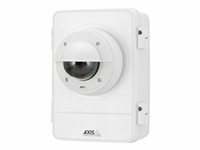 Ease of installation AXIS T98A19-VE offers several ease of installation features to simplify the work for the installers. With a selection of optional mounting brackets, it can be installed on wall, pole or building corner. The polycarbonate cabinet base is extremely lightweight and can easily be carried in one hand. For maximum installation flexibility the cabinet door can be left or right hinged. To facilitate cable routing the cabinet is fitted with a specially designed mounting plate allowing the cabinet base to temporarily be mounted in a higher position and the hinges have a stop that locks the cabinet door at 105 degrees. Vandal-resistant to withstand adversities The polycarbonate cabinet is IP66-rated for protection against the ingress of dust and high pressure water jets from any direction. The NEMA 4X rating protects against windblown dust, salt spray, rain, hose-directed water, and damage from external ice formation. It provides also IK10-rated material for protection against impact and vandalism. The surveillance cabinets support vibration rating 4M4 and 4M3. Separated compartments to enhance security For better installation and improve cost efficiency, the inner compartment with a DIN rail can be split into two sections - one to fit mains power units and a second for low-voltage units that do not require installation by a certified electrician. An optional electrical safety kit is available, which includes surge protection, a fuse and an alarm-door switch to detect cabinet intrusion or damage.